As the Republican primary election season winds down the establishment media are claiming that the Tea Party is a waning force because not all of the candidates backed by the limited government constitutional conservative movement have won their primaries. Not even Babe Ruth batted 100 percent and the media is playing the Republican establishment’s game by setting up the false standard of a perfect season as the standard of success. In yesterday’s Tennessee primary, principled limited government constitutional conservative Joe Carr came up short against establishment Republican Lamar Alexander – and we certainly wish Carr had won and we did what we could to boost his candidacy. But Carr’s backers in the Tea Party movement aren’t just running political campaigns for the candidates that share their limited government constitutional conservative worldview – they are building a movement and seeking to change the direction of this country – and by that standard so far 2014 has been a Tea Party success. Indeed, Mississippi Senator Thad Cochran is about the only Republican we can think of that ran on his record as a big government, big spending establishment Republican and that was to gain Democratic votes in a ploy that has thrown the Republican Party into unprecedented turmoil and sparked a grassroots fury that is certainly going to hurt the Republican establishment in the long term. Reagan was right; some twenty-seven million voters had voted for Goldwater in the face of the overwhelming personal attacks against him from Democrats, their enablers in the media, and from the Republican establishment. Reagan’s optimistic analysis was shared by many other conservatives and just four years later, Richard Nixon, running as a “conservative,” was elected President. The point is this – the Tea Party is building a movement, and they get the lesson of Babe Ruth’s 1927 season. As Richard Viguerie observed in TAKEOVER, in 1927, the year the Bambino led the major leagues with sixty home runs, he also led in strikeouts with eighty-nine. 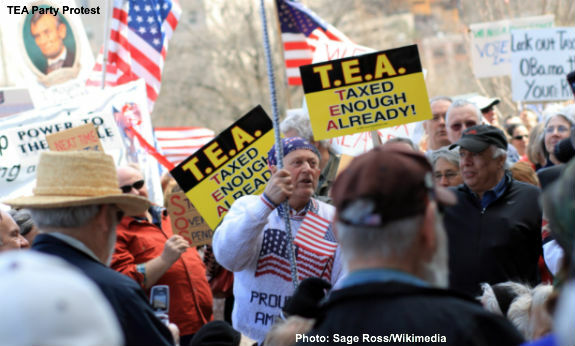 The grassroots activists of the Tea Party realize that to build a movement they must not be worried about how the establishment, the press, and others will view them if they lose. They understand that if you expected to hit a lot of home runs, you have to expect to strike out a lot. Win or lose, simply by fielding candidates and running campaigns the Tea Party movement is building the human capital of the movement, readying themselves for the next election, and learning what it takes to win, all while pushing the Republican Party steadily toward limited government constitutional conservative positions on the issues -- and that's a victory in our book. Submitted by mahamison on Mon, 08/11/2014 - 03:25. We TPs will be the irresistible wind that would batter the immovable object that is the GOPe. With time, the irresistible wind will gnaw at the foundations of the immovable object, making that object crash to the ground.